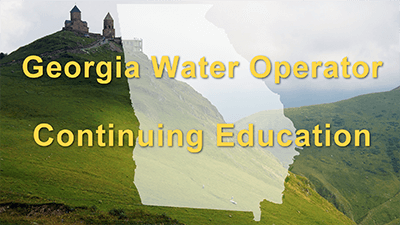 The following are continuing education courses for water operators looking to renew their Georgia water operator license. The courses we offer cover all aspects of water operation from sedimentation to hydrants and groundwater wells to disinfection. These courses have been approved by the Georgia Board of Water & Wastewater Treatment Plant Operators to provide water operators with required CE credits. What are the Continuing Education requirements for Georgia water operators? The Georgia 12-Point Continuing Education Package is designed for Class 3 licensees. In this comprehensive package, we dive into technical issues such as sedimentation and filtration, disinfection, and corrosion control. We also include a look into membrane processes, pipelines, and storage tank facilities, as well as provide detailed discussions covering basic electrical concepts, pumps and motors, and groundwater wells. So, check into it today and get your license renewal here. The course number listed must be included on every certificate of completion given. The course is approved for continuing education and must be recertified by January 31, 2020. When requesting approval for a course, or recertification of a course, applications must be submitted at least 2 weeks prior to the next scheduled board metting, and at least 10 weeks prior to the date of the courses. Please feel free to contact me via email (cgroves@sos.ga.gov) if you have any questions or need further assistance.